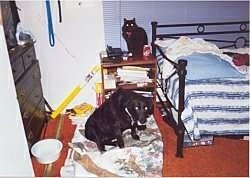 Max died just before Christmas 1999 of kidney disease. He was a Westiepoo (half Poodle half Westie). 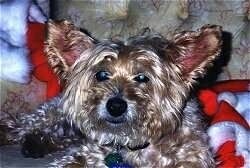 He was the best friend of Tim, Brent, Kortney and Kris for ten loving years. He is greatly missed by his family and newfound friends, Linda, Amber and Shadow. This is the last picture taken of Max as he prepared to greet Santa at the fireplace. Unfortunately Santa was not greeted by Max, only his spirit was there with the cookies and milk. Rocky was the most unusual companion I've ever been blessed with. He was capable of raising your spirit when it was down, getting the paper and putting a loving [BIG] head on your chest with a soggy chin. He was a totally loving and giving individual and non-aggressive. When I feel road rage surging up I think of Rocky and how terrible he would feel about such behavior and I am soothed by his example. 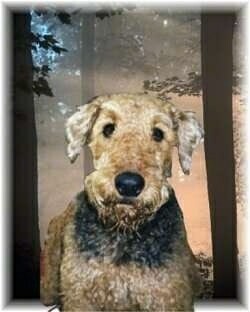 Rocky was an Airedale barely 2 years when he passed on, but he effected my life permanently. 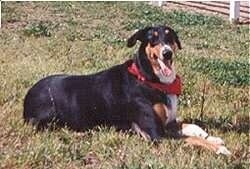 Boo-Boo was a Collie/Retriever and maybe something else. From the day we first looked into her kind, humble eyes, we knew she was the one we'd love always. Boo-Boo was fun and loving. The only time she ever growled was playing or protecting us. She had many complications in her later life, and died as a result of them in January of 2000, and was a great 7 years old. She always brought joy to us, whether it was her big overbite, or her silly ways. We will always love her and miss her. 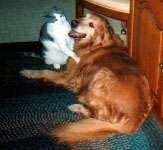 This is my dog Dusty with his companion Sebastian the cat. Dusty was born May 5, 1989. He was 98 lbs. of pure love and faithfulness to me and all that crossed his path. He loved people and food. :) We live on a lake, so he enjoyed romping in the water with the whole family and going for rides on the boat. Dusty died March 11, 2000 from lymphoma, which is a fatal cancer. 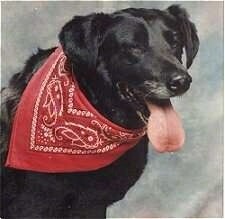 We had the pure joy of his company for almost 11 years. We miss him terribly... To him we say, "Farewell and well done, good and faithful servant." This is our beloved Missy, a part Cocker mongrel that we dearly loved and greatly miss. 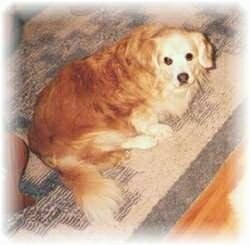 She was put to rest January 20, 2000 at the age of 20. She was a treasured friend to all who knew her. 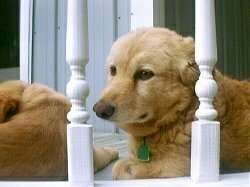 I would like to put my dog Acey on your website because she was a great dog to me and to my family. I want her memory to live on. She died of a rare cancer. We could not save her. 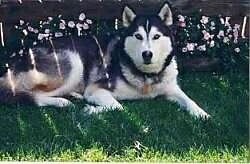 Acey was a loving, caring dog. I would take her with me when I was on my rollerblades and when I would fall down she would put her head under my arm and help me up. Acey died on August 11th, 1999.